Joseph Bellows Gallery is pleased to announce its upcoming exhibition, Carnival: Photographs by Roger Vail. The exhibition will open on July 11, with a reception for the artist from 6-8 p.m., and will continue through the 22nd of August. 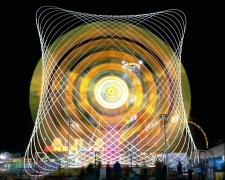 The exhibition will feature Vail’s extraordinary large-scale photographs of carnival rides in full motion; tracing the kaleidoscopic light play seen only through the extended moment that photography permits. In addition to the large-scale color and black and white images, his smaller, more intimate platinum/palladium prints will be featured in the exhibition. Roger Vail earned his BFA and MFA degrees from the Art Institute of Chicago. Since 1970 he has taught photography at California State University, Sacramento. One such image graced the cover of Life magazine, introducing a picture essay with an accompanying text by Garrison Keilor titled, A Magical Spin on a Summer Night (2006). 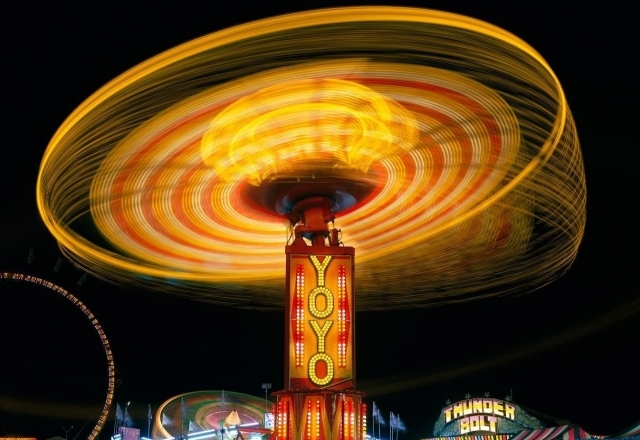 Vail's carnival rides are described and transformed through the act of photography. 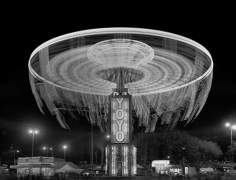 He allows the viewer to experience the flux of the ride in a single scene, rendering both the atmosphere of the night and the energy of his subject, against the recognizable background of the state fair. Vail's photographs are in the collection of numerous institutions, including: Art Institute of Chicago, Museum of Contemporary Photography, Nelson-Atkins Museum of Art, Museum of Modern Art, NY, San Francisco Museum of Modern Art, Princeton University Art Museum.